8' Full Color Custom Table Throw (+$354.00)	 ? This display is wildly popular with trade show and special event industry designers. Custom frame and graphic combinations are too numerous to catalog, so we’ve made it simple! The creators of the original Xpressions® have packaged, in complete kit form, our most popular Xpressions®SNAP!™ displays. 8' Full Color Custom Table Throw	 8' economy full color custom table throw. Graphic size: 150.5"w x 62.75"h Add your own text, designs or logo to these custom table throws or choose a solid color and get the most out of your trade show displays. Using our online design tool, you have the option to use one of our many fonts and effects or upload your designs and logos to make your table throw exactly how you want it to look. 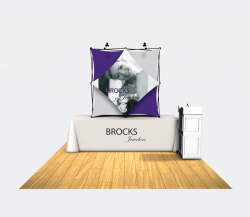 Make your trade show appearance stand out above the rest with these customizable trade show table coverings.